A couple of months ago I was invited to a special event held at Liberty, to introduce us beauty bloggers to the French brand Anne Semonin. All based around the concept of made to measure skincare, the brand uses oils to treat/address different skin types/issues. As an Anne Semonin customer your beauty therapist (they do beauty treatments too) will customise the skin care to suit your needs by blending different quantities of oils – creating a far more accurate skin prescription than the simple dry/oily/combination options that we are used to. At the event we were able to have a play with some of the different oils, whilst one of the therapists for the brand talked through the various benefits of each oil and how they blend them to create truly personal skin care. Since last year when one of my early reviews for the blog was an oil cleanser I have been a real advocate of oil based skin care products. I adore oil cleansers and consider them a must have for my skin routine and enjoy using oils as an overnight treatment when my skin is dry. 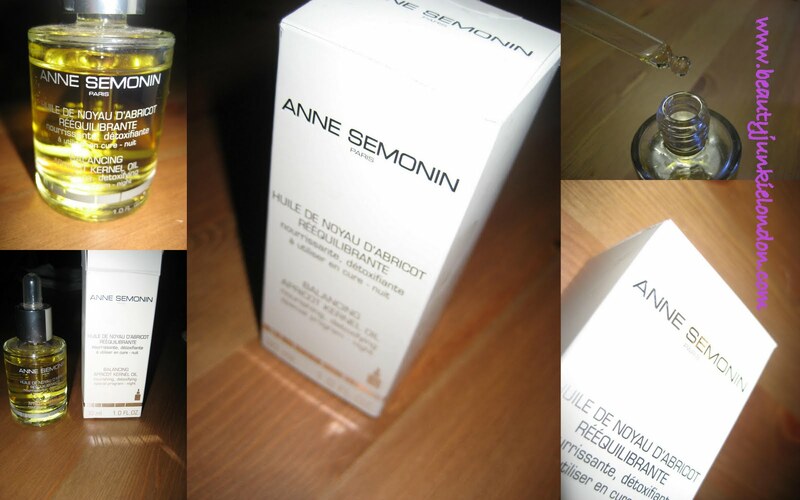 Following the event, I was given a bottle of the Anne Semonin Balancing Apricot Kernel Oil to take away and have play with. As you probably guessed, this sort of customised product doesn’t come cheap – having just checked on the website, the Apricot Kernel Oils sell for around 97euros… so I’m sure some people are going to cringe when they read what I have been using the oil for. I have used this on my face as an overnight treatment, especially when there was the snowy cold spell and my skin went a bit crazy. It is a lovely treatment, leaving skin totally nourished but not greasy. I have never suffered any breakouts after using this. But, face aside – my personal favorite way to use this oil is as an overnight hand treatment. I have extremely dry hands, and have done since I was a child. In winter they can get so dry that they crack and can occasionally bleed – it’s not pleasant, it’s uncomfortable and can be very embarrassing. So I actually have no reservations about using such an expensive oil to treat my hands – yes, it’s expensive, but I only use one or two pipette drops each time and I can see this lasting for ages – and if it works, then I am happy. I love how this soaks straight into hands, it doesn’t leave them too greasy (although I wouldn’t go stroking antique silk straight after applying) after a nights sleep I wake up to soft moisturised hands (or face) which feels slightly ‘plumped’ – the lines that I have all over my hands due to them being so dry, for so long seem to have been filled out a bit after use and I feel about a million times more confident. As an added bonus, it also works well on cuticles – also very dry and in need of a miracle. This oil was provided free of charge. All reviews/opinions are honest/my own. I was astonished that using oils overnight was recommended to me, and I have very oily skin. I am currently using the Lotus Face Treatment oil by Clarins. And as you mentioned, the same, you only need a minute amount to apply. My face feels great in the morning! And it does not leave your skin feeling greasy for bed contrary to one might think. I love oils in general, for cleansing, moisturising and as a deep-conditioner for hair. This one is very expensive, but really lovely. I doubt I would re-purchase though. There are cheaper oils out there that seem just as good. Which reminds me, I want to get myself a bottle of that Nivea Shower Oil….